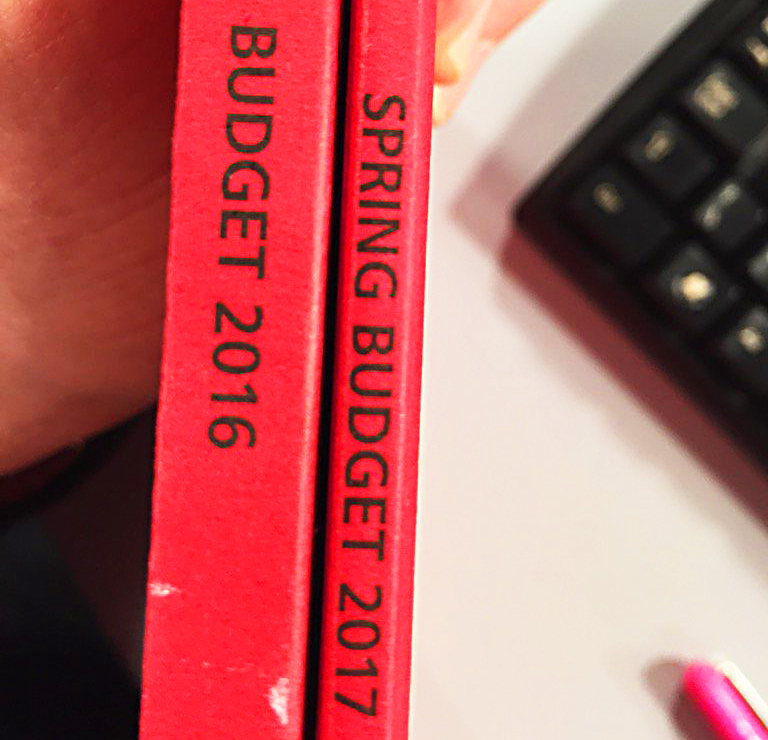 Today’s post is about this afternoon’s Budget, the last ever in the spring time. 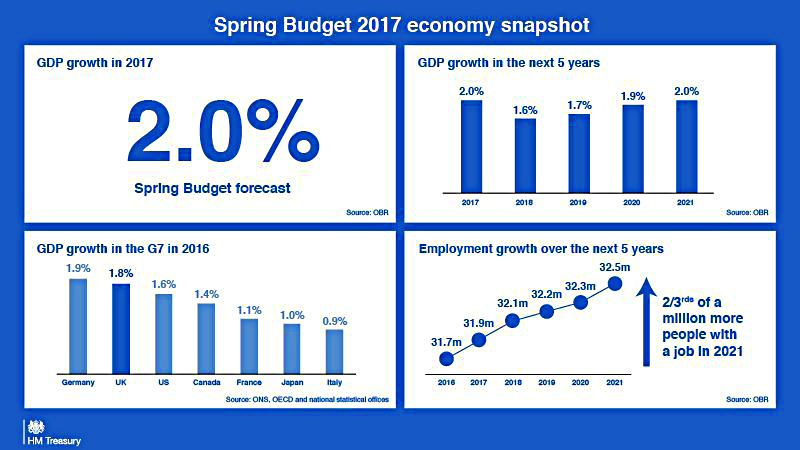 Welcome to Budget 2017. From this Autumn, there will be a single fiscal event per year. This should mean that proposals can be approved in time for the next tax year, and businesses and households will have more time to prepare. Let’s start with things that had already been promised in previous budgets, but hadn’t materialised yet. The Primary Residence IHT exemption (or “main residence nil-rate band”) is due to come into force in April 2017. And it means that a couple will be able to pass on £1M between them by 2020. This allows parents to pass on another £100K (rising to £175K) of their housing wealth to their children (only). At the same time, Probate Fees are being dramatically increased. For estates above £500K, the fee will increase from £215 to £4,000. For those above £2M, the fee rises to £20,000. The income tax Personal Allowance will rise to £11.5K and the higher rate threshold to £45K. By the end of the parliament these will be £12.5K and £50K respectively. The minimum wage will rise from £7.20 an hour to £7.50, on its way to the 2020 target of £9 per hour. Corporation tax cuts have been announced, with 17% the target for 2020. Perhaps it could go lower still? The new Lifetime ISA (LISA) goes live. The LISA is available only to the under-40s, and can be used as the deposit on a property, or withdrawn tax-free after age 60. It is funded from post-tax income (up to £4K pa) but the government adds a 25% bonus (equivalent to the rebate of 20% income tax), which is clawed back if money is withdrawn – other than for a property purchase – before age 60. So unless you are buying a house, the LISA is bad for higher-rate taxpayers, and no improvement for basic rate taxpayers. Meanwhile the regular ISA allowance goes up from £15K to £20K. Buy-to-let mortgage interest relief will start to be tapered down from 40% towards 20%. Update: no changes were announced to any of these plans, so they will all go ahead. Now let’s talk a little about what people were predicting – or in many cases, hoping for – in the run up to today’s speech. Hammond had warned that there would be “no spending sprees” because he wanted to ensure that the UK has enough “gas in the tank” for the coming (post-Brexit) years. 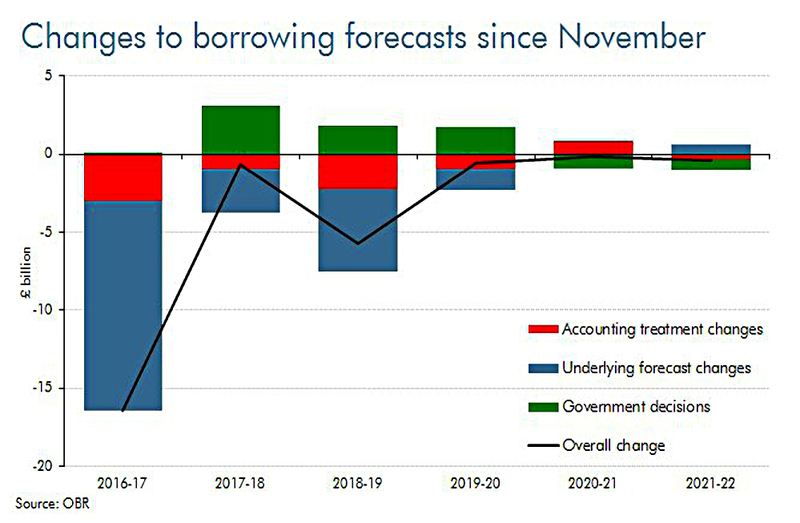 Borrowing was predicted to drop because of decent growth – due to be revised up from 1.4% to 2% for this year – and higher than expected tax receipts since the Brexit vote. Alternatively, with my cynical hat on,1 there’s no point sticking with the previous pessimistic predictions now that people have voted to leave in any case. 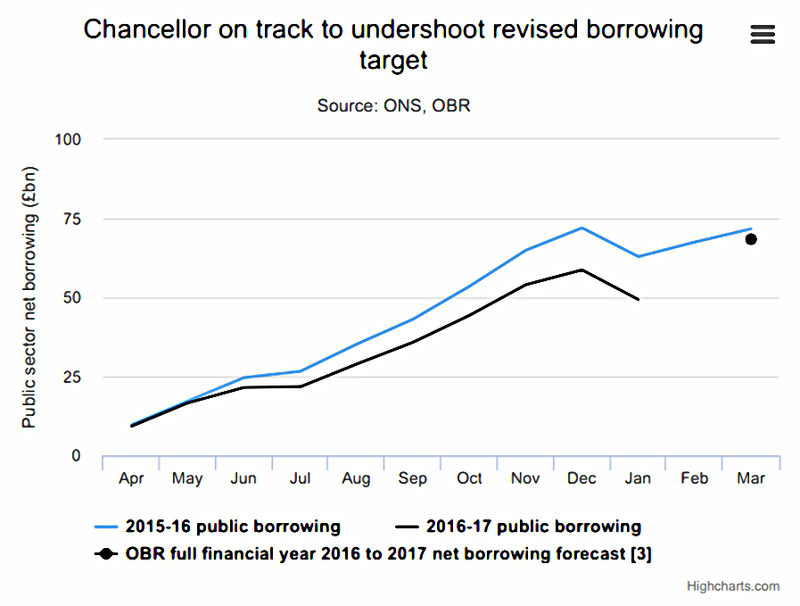 New estimates were for a revised deficit of £16bn by 2020-21, with £29 bn less borrowing up to that point, and possibly £12 bn less this year. 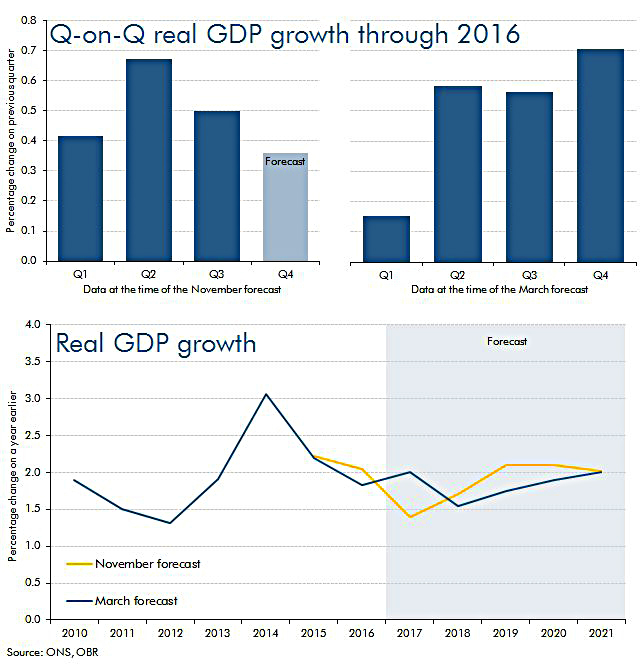 Update: the OBR has upgraded its forecast for growth next year from 1.4% to 2%. Spending was expected to be cut further. Taxation has now reached its highest level in 30 years, and there’s no precedent in the UK for raising a higher proportion of GDP. So another 3% to 6% was expected to be trimmed by 2020. But there could be planned increases in infrastructure spending, or R&D. Update: there wasn’t much in the way of new cuts, and not much infrastructure / R&D spending. Commentators estimated that there is a slight net giveaway in the first two years, which is recouped in years three to five. There was talk of “allocating £300m to support the brightest research talent, including for 1,000 PhD students in Stem subjects”. Also “£270 million to keep the UK at the forefront of disruptive technologies like biotech, robotic systems and driverless cars”. And “£200m for projects to get private sector investment in full-fibre broadband networks”. The NHS / Social Care funding gap was expected to be addressed. Some thought that there would be a new social insurance levy (similar to NICs). 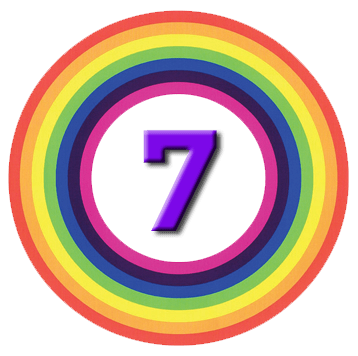 There could also be a cap on what an individual pays towards their care (a manifesto pledge at £72K, since pushed back to 2020) – this might encourage a private insurance market. Possible alternatives to more cash included the integration of health and social care at a local level, and more emphasis on prevention. 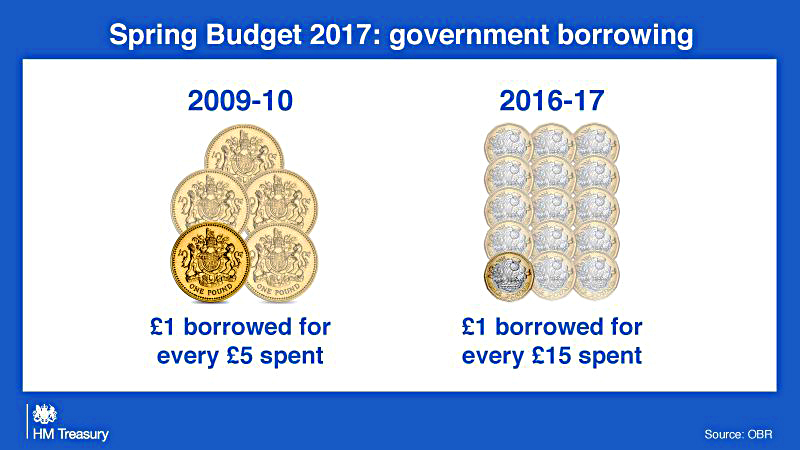 Update: a new pot of £2bn over three years was announced, with £1bn available in 2017/18. Left-wing commentators thought that this wasn’t enough. There will also be a Green paper published later this year on long-term funding for social care. Council tax was predicted to be an issue, with councils restricted to 4.99% increases (to fill the social care gap) before a local referendum is required. But even 4.99% will be very unpopular with most residents. Update: nothing on council tax per say, but an extra pot for social care (see above). Business Rates have been in the papers, too. The delayed 2015 revaluation means that seven years of property price changes are being factored in. London and the South East will have big increases while the North will largely have reductions. Small retailers in expensive locations will be hit hardest, threatening the diversity of high streets. Update: there was some capping of first year increases, and a special arrangement for most pubs, but its not clear that these changes will fix the underlying problem. Hammond promised that “no business losing small business rate relief would see their bills increase beyond £50 a month”. Nine out of 10 local pubs will have a £1,000 discount. A £300m fund will be created for local councils to offer discretionary relief. Some commentators thought that the self-employed would be targeted. There are five million self-employed workers in the UK (that’s 1 in 7) – up by 45% since 2000. It’s partly old workers juggling (precarious) “portfolio” careers, and partly tech startups looking to avoid employing workers. Freelancers in general pay a bit less tax, but this could be about to change. This was originally intended to compensate for the higher risks, but these days, anyone who can be described as “exploiting a loophole” is fair game. It’s all about what the “just about managing” (the JAMs) and the “hard-working families” would think. Possible changes include higher NICs or more taxes on dividends. See also: Autumn Statement 2015 - U-turn or spin? 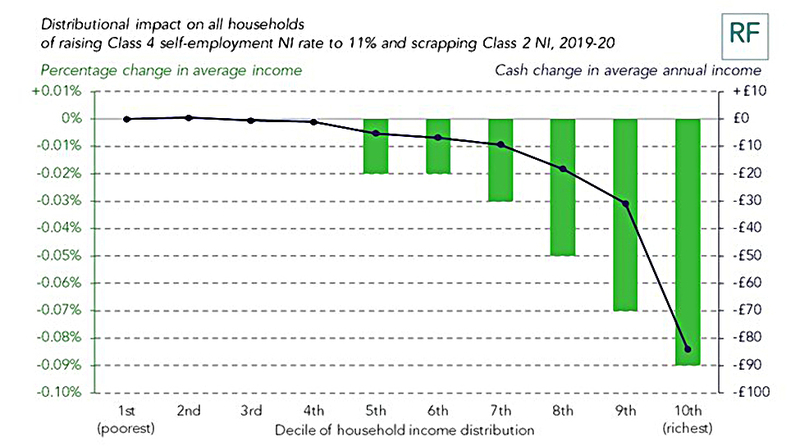 Self-employed NICs will rise by 1% in April 2018 (to 10%) and another 1% (to 11%) in April 2019. The triple-lock on the State Pension has come under fire, but the government has already committed to supporting it through this parliament. Private pensions were also thought to be a target, perhaps through an extension of the LISA regime, or by flattening the tax relief rates to 30%, 25% or even the basic 20% rate. The annual allowance and the lifetime allowance (LTA) could also be cut (or the indexation of the LTA due to begin in 2018 could be postponed). Update: there were no changes to the State or to private Pensions. There might also be details of a new National Savings Bond, which was floated in 2016. This was set at an indicative 2.2% gross over three years and will be launched during the new tax year. It’s capped at £3K per person so is virtually pointless – annual interest will be £66. Housing is a perennial problem in the UK, and more support for renters in particular was expected. There was also the possibility that stamp duty could be waived for “last-time buyers” – older homeowners who want to downsize, but are put-off by the transaction costs. Brexit was likely to get a mention, perhaps in the form of future R&D tax reliefs. Update: There was nothing on housing and not much on Brexit, other than what great shape we are in. There is a five-­year “tax lock” on income tax, NIC and VAT, so we shouldn’t expect any changes here. But we did get the increase in NICs for the self-employed. 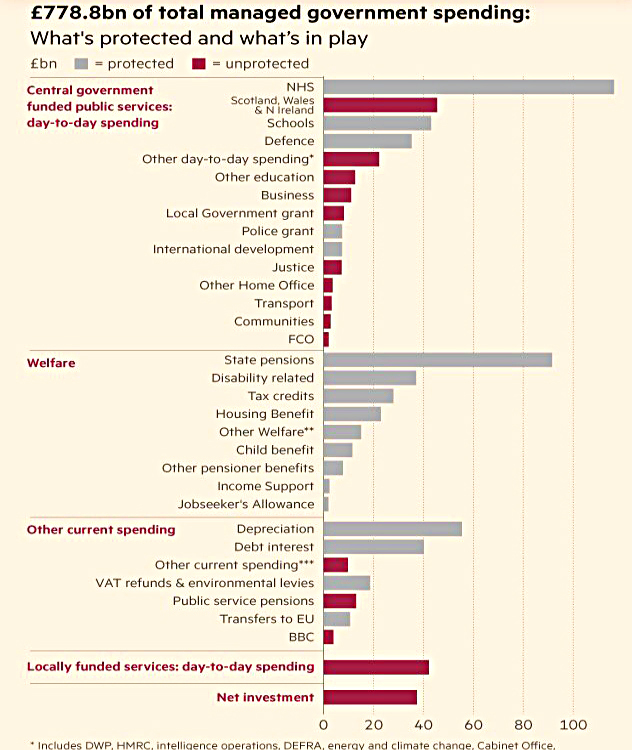 One of the shortest and quietest Budgets for a while. NICs are going up to 11% not 10% from April 2019. They are currently 9%. You are of course correct. The first draft of the article didn’t mention the 2019 increase and I forgot to move the bracket when I inserted the reference. Fixed now.